New York choreographer Sidra Bell's "Lily" left many powerful impressions. Kenny Corriganin Alan Obuzor's "TheOther Side of Now"
In dance, the word "contemporary" has several meanings. It can describe a style of dance or it can simply mean a dance that's created today. 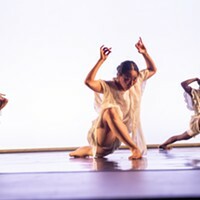 In the case of the Point Park University Conservatory Dance Company program Contemporary Choreographers, different meanings applied to different works. The program began with Texture Contemporary Ballet artistic director Alan Obuzor's "The Other Side of Now." The five-part ballet set to world music featured contemporary ballet choreography and opened with a dozen dancers flooding the stage in a cacophony of non-unison dance phrases. Male-female pairings intermingled with lines of four or five dancers crisscrossing the stage, each new flurry of movement stealing focus from the other. A young choreographer with potential, former Pittsburgh Ballet Theatre dancer Obuzor's fast-paced and vibrant choreography was a challenge for the student dancers, who at times fell short of meeting it. A bevy of non-balletic contemporary arm and hand movements added interest to choreography that, although nicely arranged, appeared academic in style. Most interesting was a trio in which two male dancers lifted and twisted a female dancer into complex and daring aerial positions. Next, New York choreographer Sidra Bell's "Lily" left many powerful impressions. With an in-your-face attitude, it's a satire on contemporary culture's images of women, set to a soundscape that included everything from club music to a woman speaking French with a lisp. The work featured nine female dancers moving like android runway models whose circuitry occasionally wigged out. The dancers convulsed, shook violently and shot fake smiles and sarcastic glares at the audience. Other times they moved with confident grace or alluringly strutted about the stage. Bell's choreography for "Lily" and the dancers' performance of it were brilliant. The program's lone non-commissioned work was Alan Hineline's "Twist" (2003). The neo-classical ballet looked anything but contemporary. Set to music by Jerome Begin, it had the look and feel of a ballet created in the 1980s. Still, it was exquisitely crafted, with sleek lines and fluid phrasing. 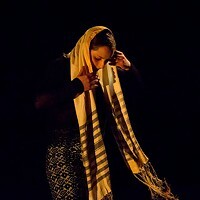 It was highlighted by the adroit performances of dancers Molly McMullen and Hank Hunter. The program concluded with Darrell Grand Moultrie's "Modes of Expression," a relentless, physically demanding and stylistically contemporary dance work.